Built by the Moors in a defensive position in the center of the Caliphate of Cordoba, Cuenca today is an unusually well-preserved medieval fortified city. 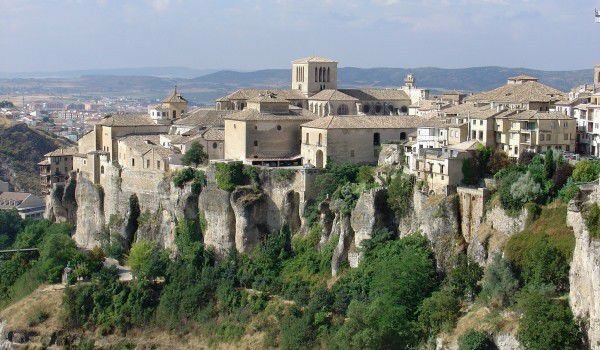 It is located in the central Spanish autonomous region Castilla-La Mancha, it is the capital of the province of Cuenca. Situated on the steep hills that descend down to the flow of rivers Uekar and Huécar, Cuenca is divided into new and old. The new town of Cuenca is located southwest of Old Town, which is also divided by the River Huécar. Because of the importance of the old town Cuenca is included in the list of world historical and cultural heritage site list by UNESCO in 1996. Cuenca is also candidate for European Capital of Culture in 2016. The rocky hill of old town is surrounded by the curves of the river Huécar from the north and its tributary river Uekar from the south. The second runs into the first at the famous Bridge of San Anton in the bottom of the old town. The population of Cuenca is about 50 000. In 784, Cuenca already existed under that name. The city was ruled by the family Banu Dil-Nun – a Berber clan, subject to the Caliphate of Córdoba. It was connected to the Kingdom of Castile Alfonso VIII. In October 1177 Alfonso X the Wise is he who gives Cuenca city status. Although a small town, Cuenca fits so many remarkable monuments and authentic architecture that one day is hardly enough to see detail. The old town of Cuenca is an outstanding example of a medieval fortress town that has preserved intact its original urban landscape, with many examples of religious and secular architecture from the 12th to the 18th century. Although from Islamic origin Cuenca reached its greatest prosperity during the Middle Ages and the Renaissance, when the village has a leading position among the cities belonging to the Castilian crown. When the Moors conquered Spain, they chose to build one of the best protected areas in the region. The city served as a control point of Kura de Cuenca, located in the heart of the Caliphate of Córdoba. Tour of historic Cuenca is long. The old town is built of very narrow streets surrounded by buildings on both sides. Particularly interesting is the Catedral de Cuenca, which was declared a national monument of Gothic-Norman architecture. The cathedral in Cuenca was built between 1182-1270. Its facade was rebuilt after having been half-destroyed in 1902. At present the temple is restored. It is believed that this temple was the first built in Gothic style in Spain, together with the Cathedral of Avila. Another important landmark of Cuenca is Tower Torre Mangana. It was built in the 16th century and today is considered a symbol of the city. It was made in 1565. In the 18th century, the tower was badly damaged, but then restored with original Arabic architectural motifs in 1926. One must admire the Casas Colgadas, which are an integral part of the townscape of Cuenca. They are a unique example of a widely spread in the past, local architecture, which is now preserved only in small part. They were built in the 15th century over the gorge of the river and today serve as a tourist attraction. They have a restaurant and museum of abstract art. The hanging houses in Cuenca serve as the background of millions of images made from the bridge of San Pablo. Be sure to explore all other churches in Cuenca. Particularly remarkable is the Bishop's Palace, and Cuenca’s El Castillo. It is a fortress, buried in ruins, which shows the oldest such in Cuenca. Retained is only a small part of the walls and a tower. The castle was home to the Holy Inquisition after 1583, and was finally destroyed by French soldiers during the Spanish War of Independence in the 19th century.